Growing up in Minnesota, I wasn’t particularly familiar with smoked salmon or its popularity. My limited experience consisted of the bagels and Nova lox my father made a point to bring home every time we visited NYC. It was considered a treat when we had it (though I may have been more into the bagel and cream cheese at that time than the salmon). I had no idea that there were different kinds of smoked salmon and that it could be bought by the pound and on sandwiches at almost every New York deli. The quality of smoked salmon varies – usually depending on price but also on the smoking method and/or curing method. Lower quality smoked salmon is usually saltier and somewhat mushier. I like Nova lox, which is technically a cold smoked salmon, but regular lox (which is just cured and not smoked), Scottish, or Norwegian smoked Salmon are also good depending on your preference. Whether you’re eating it on a sandwich or making a spread such as this, it’s important to use a smoked salmon you really like. Unlike most salmon spreads, the actual salmon flavor (and not just the saltiness) can be tasted in this dip-like spread. The horseradish, scallion, and dill complement the salmon and provide a freshness. No cooking, no fuss. 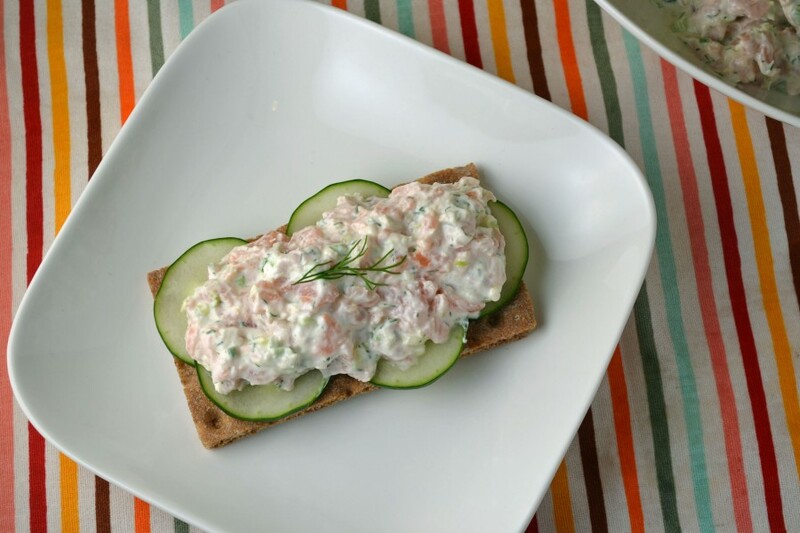 Add a few slices of cucumbers for a refreshing crunch and this Smoked Salmon in Sour Cream-Horseradish Sauce is the perfect light lunch or appetizer on a hot summer day. Add scallions and dill to smoked salmon. In a separate bowl, combine sour cream, horseradish, and mayonnaise. Season with salt and pepper. Add dressing to salmon mixture. Toss gently. 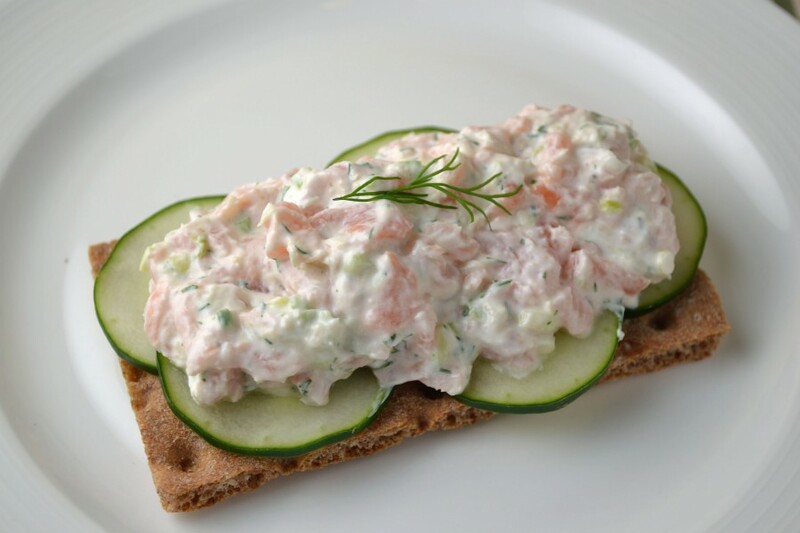 Serve on thinly sliced rye or pumpernickel bread or multi-grain crackers layered with cucumbers (if using). Hi Megan! This looks great – We had poached salmon with a sour cream dill sauce. Not sure where I got the recipe – maybe your grandmother’s? Not sure. Anyway, I was delighted to visit your site and find so many more great looking recipes than when I was here last time. Perhaps we will try this in the winter in Shanghai when fresh salmon is rare. We do get smoked salmon, and it is tasty. Thanks for the great idea.